Countless art crafts have been made earlier with this superb material called driftwood. Are you familiar with the driftwood? If you are a crafter and an art lover then you must be aware of it. Drift wood is basically a form of marine debris, and sometimes it becomes a form of shelter and food for the birds fish and other aquatic creatures. We have recycled many practical art crafts with its help. We have used it in making lamps, racks, hanger and many decoration pieces as well. 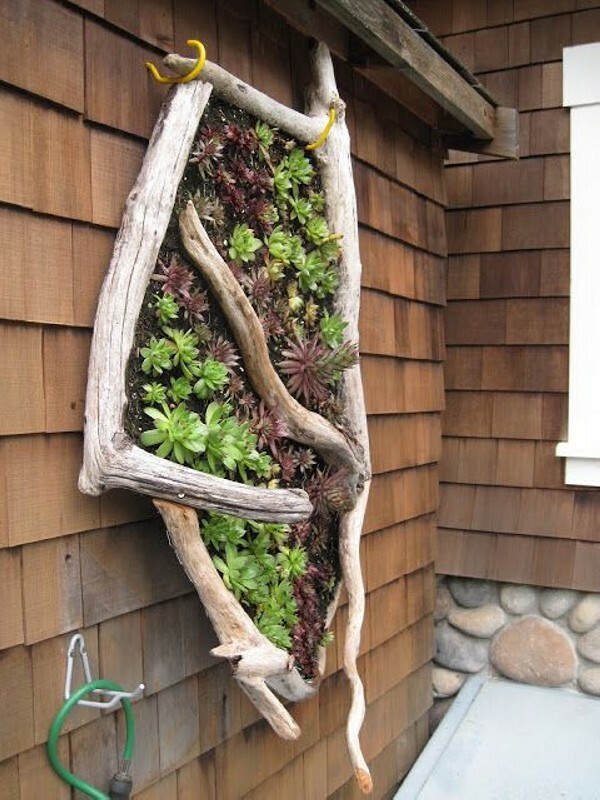 This is also very popular in garden and wall art ideas. 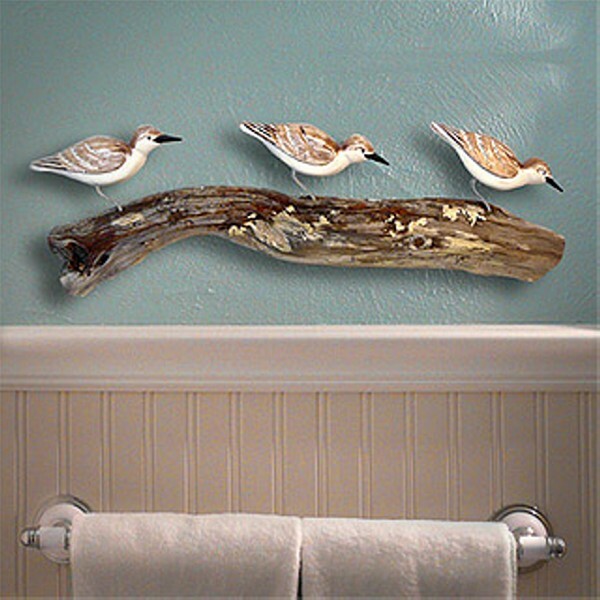 Now in here we are going to discuss some of amazing driftwood wall art ideas that are escalating the beauty of room or entire home interior. 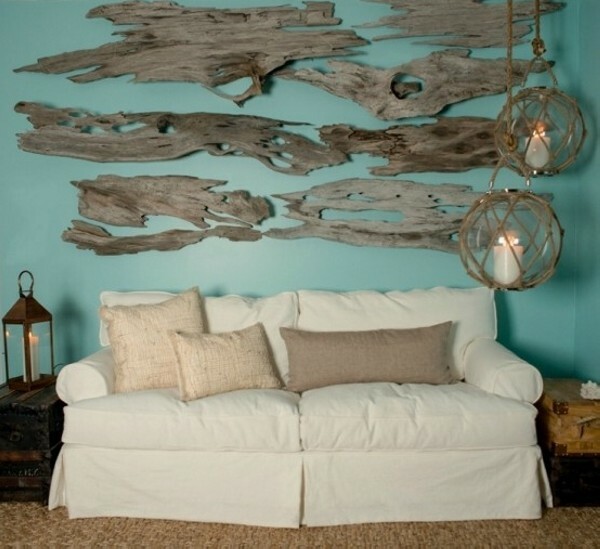 If you are a true art lover then necessarily you would love the rough and rustic touch of driftwood in your house. 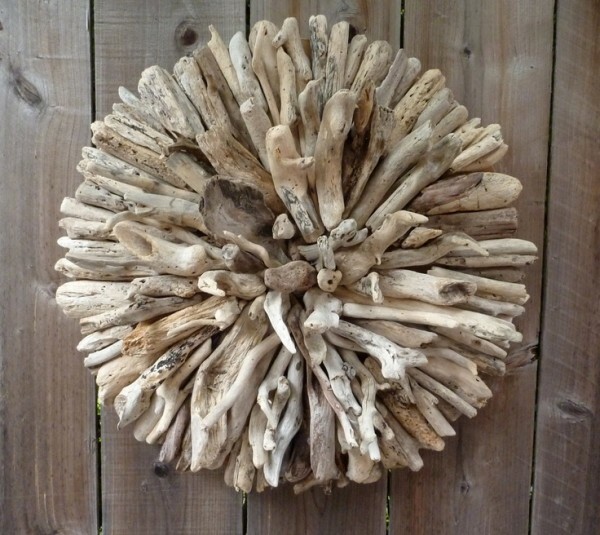 Have a look on this very first demonstration of driftwood being used in wall art. We can see some robust roots of tree are pasted along with the wall that is already matching with the color of wall. Their rough and de shaped texture is giving them a floral look instantly. 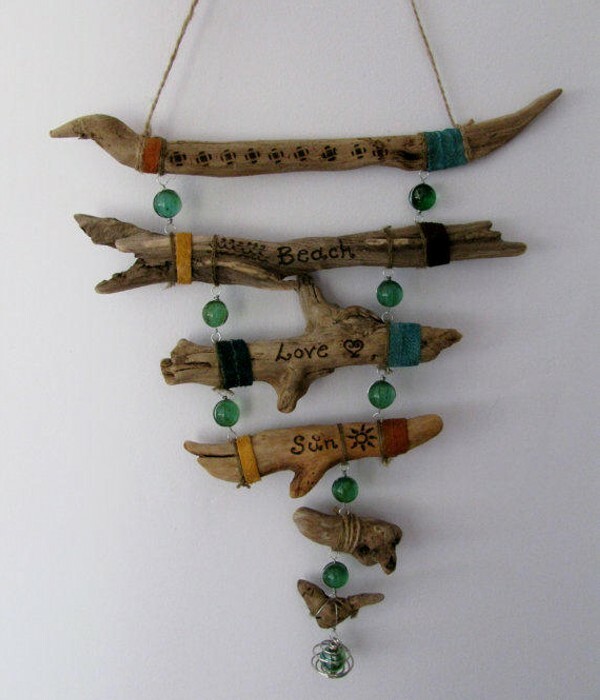 Though driftwood is nothing more than some rough pieces of wood that are neither stylish nor well shaped, but just with your intuition and creativity, you can use them in such a manner that you can create a heaven of decoration pieces upcycled with the driftwood. Driftwood itself is not a beauty, but it is your imagination and your arrangement that makes it a beauty. Like in this project an absurd piece of driftwood is used on an accent wall having creaming tiles below it. It is certainly adding to the beauty of the wall to a great extent. Racks or hangers are used almost in every house hold. They not only are smart storage hacks but they also make it easy for us to place or keys or some other daily use accessories on them so that we may not forget them in the hour of need. I was the one who was always having this problem. I was never aware where my car keys are. 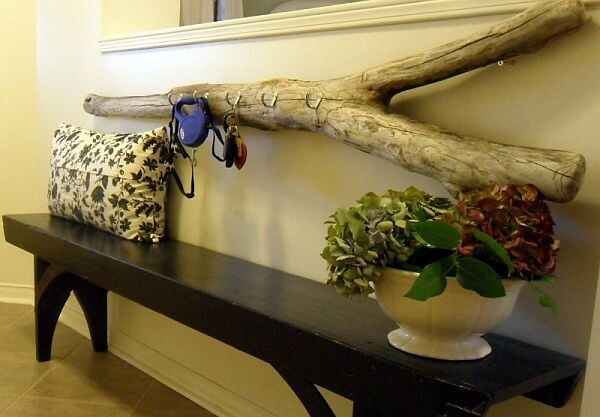 So this is a best inspiration for such people to make this driftwood recycled key rack. Some metallic hooks are fixed into the wooden piece, where you can hang your keys or other accessories. Drift wood is something that is easily accessible for all the people who visit the beach frequently because these driftwood pieces are easily found on the sea shores. They are just washed away on the seashore by the act of wind or the water. So you can have these wooden pieces free of cost. 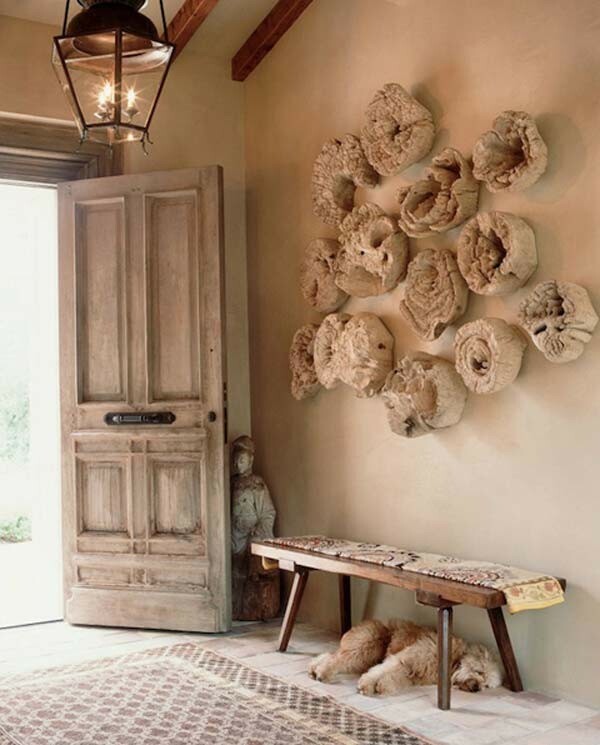 Once again here in this project a robust driftwood piece is used in a very fine wall art project. It is just like bringing the wild beauty of nature right inside your home. You can see here a bunch of artificial birds walking on this branch of driftwood. As we discussed earlier that driftwood is easily available and also free of cost, so you can collect it in bulk. 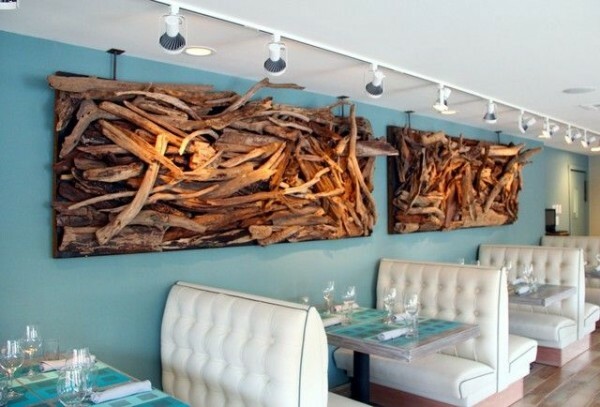 And if you have piles of driftwood at your disposal, just feel free to use it in wall art ideas. Just like the way it is used here in this project. This is a restaurant where sittings are arranged in a sequence. 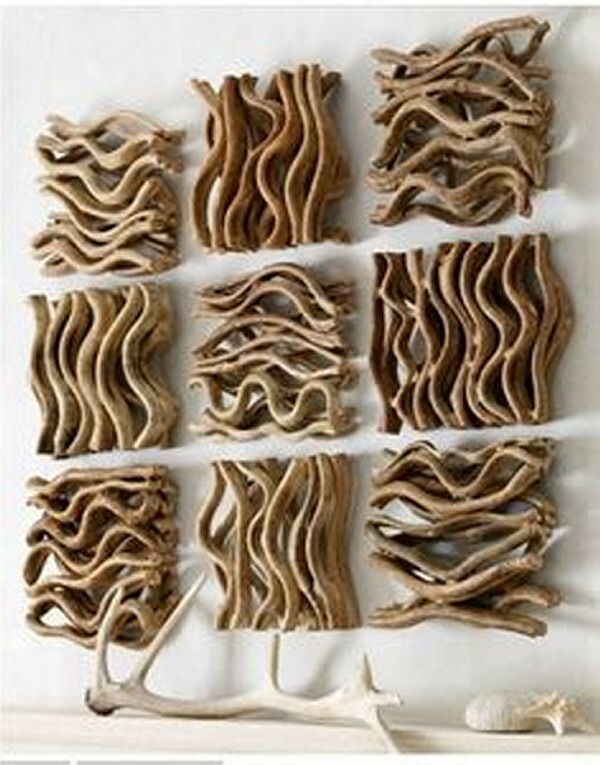 While driftwood is used in wall art in bulk. Huge wooden sheets are fixed along the wall and many absurd driftwood pieces are fixed in this rectangular wooden sheet. It really adds a lot to the interior beauty of the restaurant. As we have described the certain texture shape and color of the driftwood. These are in simple words, de shaped broken pieces of wood and have no beauty at all, it is your power of art and imagination that makes them look pretty. It depends on you that how you use them. 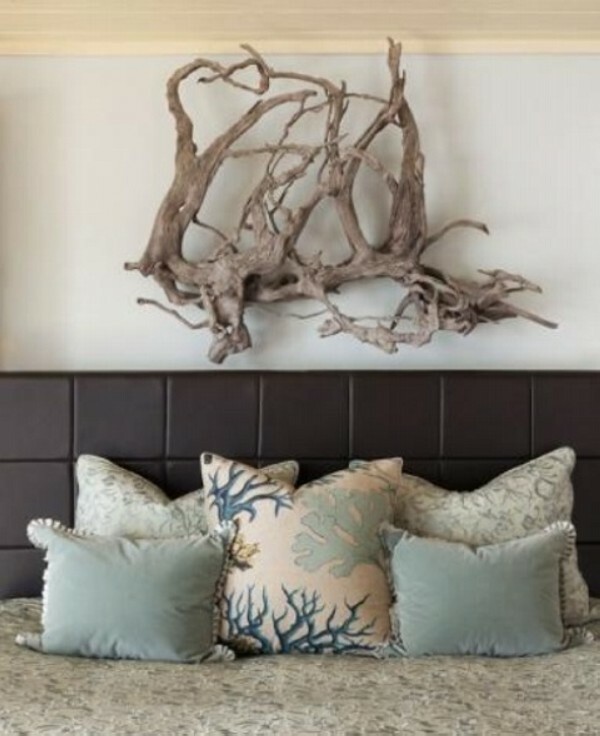 Another beautiful demonstration of driftwood wall art is reflected here. 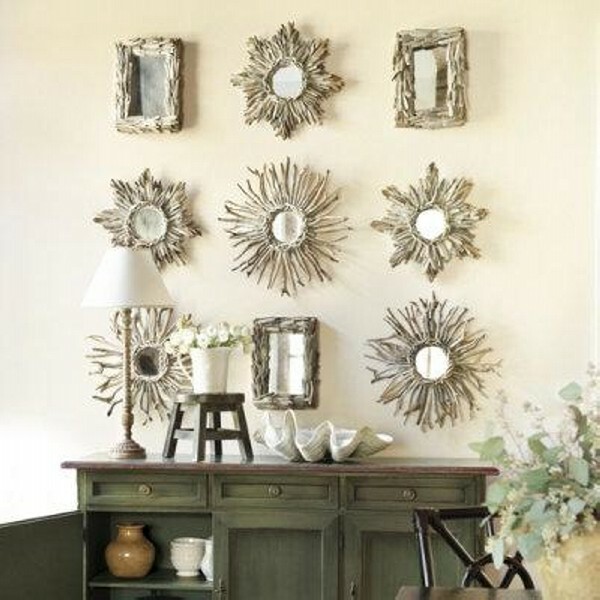 Here we can see multiple wall mirrors which are made straight by upcycling the driftwood. Just a piece of mirror other than the driftwood is used in its making and they are installed in a sequence. Driftwood which a form of marine debris, it has no regular shape. As we said earlier that these are just the de shaped and broken pieces of wood that are washed away on the sea shores by the act of wind and water. Here if we ponder on this project, some curvy lengths of driftwood are pasted on the wal in square shaped spaces making a specific sequence that is following a special pattern. These lengths are pasted along the wall horizontally and vertically as well. This could be a great pattern for your bedroom if you want to add some rustic touch in your surroundings. A house or a room where every thing is perfectly designed and placed. It is also very well painted and all due care has been taken in making the entire room interior, if you add something absurd here, trust me it would be a real breakthrough artistically speaking. Just like a driftwood piece is used here in perfectly designed room interior right below the LED and above the fire place. This is a great combination of interior designing along with a blend of rustic dingy touch in a neatly decorated room. 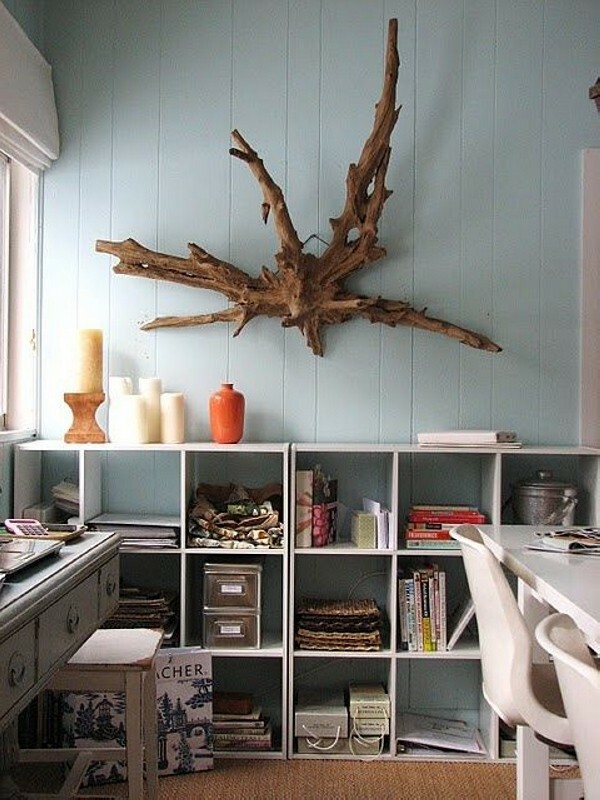 This is all the matter of your imagination and aesthetic sense that how you use the driftwood in wall art. 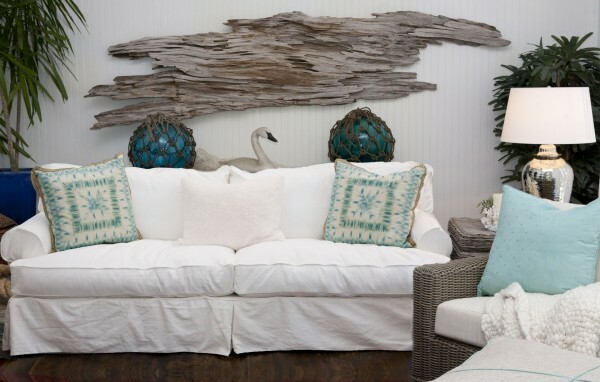 Here is another example where the scattered driftwood pieces fixed along the wall are giving a rough and wild look right inside a neatly painted living room. This is only you who plan to use driftwood in a certain manner in which it looks great to the vision. 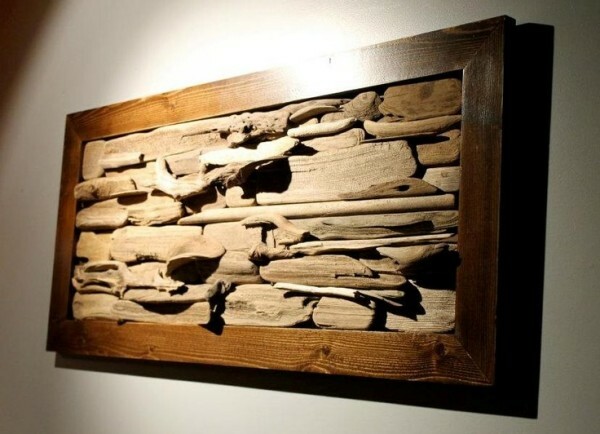 In some other projects driftwood is filled in a wooden box which is pasted on the wall just like a photo frame or any other thing that can escalate the beauty of your wall.